Williams’ tense appearance on the show earned almost 2 million views after he gunned for fellow comedians Tiffany Haddish & Kevin Hart, but his famous peers were the least of his worries. 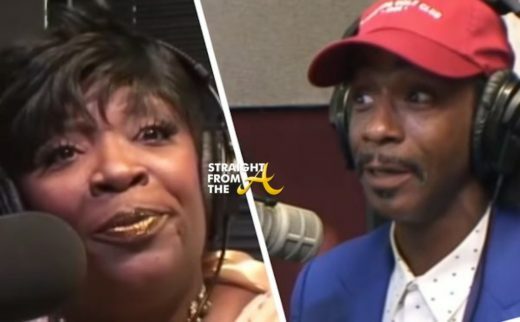 Meanwhile, the REAL tension was brewing in town as Wanda Smith, the co-host who was hit hardest by Katt’s lethal tongue, became the target of media criticism over the interview. As the conversation heated up, Wanda’s husband, LaMorris Williams, confronted Katt when he arrived at the Atlanta Comedy Club in Norcross this past Saturday. Katt apparently exchanged words with Wanda Smith in person which sparked another kind of battle. 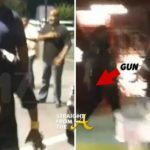 Smith’s husband, LaMorris reportedly pulled a gun out on Katt and that sparked a second debate… how far is too far? It was only “jokes” right? Apparently it was that statement that was the straw that sparked the fire inside her husband, as he stepped to Katt to checked him for disrespecting his wife. Witnesses say that Katt could be heard yelling obscenities at LaMorris, who eventually pulled a gun on Williams and threatened him. Katt reportedly fled the scene after the gun was drawn and police were called to investigate. 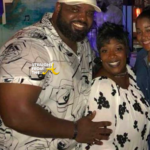 The police report filed by the off-duty Gwinnett County Police Department Cop who was working the club indicates that Williams fled for his life after being confronted by Wanda’s husband. 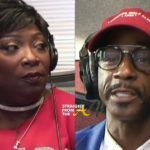 According to the officer, Wanda Smith (Sellers) and Katt Williams had a verbal altercation at the Atlanta Comedy Theater that stemmed from an interview that Wanda conducted with Katt previously in Atlanta. Katt told the officer that Wanda’s husband, Lamorris Sellers, pulled a gun on him and pointed it in his face. Katt and his security guard fled the Food Depot next door where the officer had his initial contact with them. After meeting with Katt, the officer approached Lamorris and asked him what happened. Lamorris said that Katt had a verbal altercation with Wanda. He said that Katt indicated that he wanted to fight. 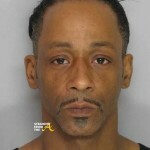 According to Lamorris, he approached Katt and chased him into Food Depot where he left him and returned to the Atlanta Comedy Theater. When asked if he had a gun on him, he said yes. Lamorris stated that as he was chasing Katt, his gun fell from his waistband and he bent to retrieve it however, he never pointed it at anyone. No independent witnesses came forward to speak with the officers about what happened. The officer viewed the video footage from the Food Depot surveillance cameras. The footage shows Lamorris chasing Katt into the store; however it does not show Lamorris with a gun in his hands. Katt has declined to press charges, however I suspect footage of the incident will be leaking soon. If anyone has any information to share in this case, please contact GCPD detectives at 770-513-5300. To remain anonymous, tipsters should contact Crime Stoppers at 404-577-TIPS (8477) or visit www.crimestoppersatlanta.org. Crime Stoppers tipsters can receive up to $2,000 for information leading to an arrest and indictment in this case.